The Mordaunt was launched at Depford, near London in 1681. It was commissioned by a syndicate of shipowners headed by Lord Mordaunt. However, he later became the sole owner of the vessel, when the other members left that association. The aim in having such a greatly armed private ship was to eliminate the war ship stock. This idea aroused some suspicion; therefore the Ambassador of Spain presented his complaints to the Court of St. James, asserting that a warship owned by private people could have been easily taken by the Elector of Brandenburg, who was completing a fleet to move against Spain. The vessel was sequestered, and Lord Mordaunt was forced by the Court to limit the armament and crew. In 1683, the ship was seconded into the Royal Navy, where it remained until 21 November, 1693, when it disappeared in the open sea of Cuba. 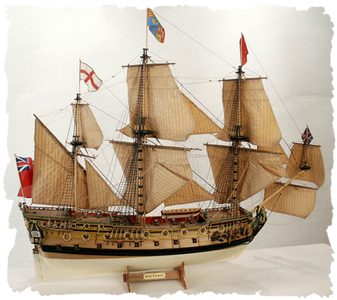 A model of this ship is showed in Greenwich Museum.